Neuromorphic electronic engineering takes its inspiration from the functioning of nervous systems to build more power efficient electronic sensors and processors. Event-based neuromorphic systems are inspired by the brain's efficient data-driven communication design, which is key to its quick responses and remarkable capabilities. This cross-disciplinary text establishes how circuit building blocks are combined in architectures to construct complete systems. These include vision and auditory sensors as well as neuronal processing and learning circuits that implement models of nervous systems. Techniques for building multi-chip scalable systems are considered throughout the book, including methods for dealing with transistor mismatch, extensive discussions of communication and interfacing, and making systems that operate in the real world. The book also provides historical context that helps relate the architectures and circuits to each other and that guides readers to the extensive literature. Chapters are written by founding experts and have been extensively edited for overall coherence. 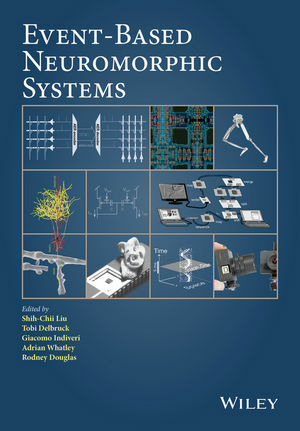 This pioneering text is an indispensable resource for practicing neuromorphic electronic engineers, advanced electrical engineering and computer science students and researchers interested in neuromorphic systems. Summarises the latest design approaches, applications, and future challenges in the field of neuromorphic engineering. Presents examples of practical applications of neuromorphic design principles. Covers address-event communication, retinas, cochleas, locomotion, learning theory, neurons, synapses, floating gate circuits, hardware and software infrastructure, algorithms, and future challenges. Shih-Chii Liu is a group leader at the Institute of Neuroinformatics, University of Zurich and ETH Zurich. She received her Ph.D. in the Computation and Neural Systems program at Caltech. She has been an instructor and topic organizer at the NSF Telluride Neuromorphic Cognition Engineering Workshop in Telluride, Colorado since 1998. She has also co-authored a book on analog VLSI circuits (published by MIT Press), is an IEEE Senior member and has held offices in a number of scientific and IEEE engineering international conferences. Dr Liu has been working on event-based vision and auditory sensors, multi-neuron networks, and asynchronous circuits for more than 20 years. Tobi Delbruck has been Professor of Physics and Electrical Engineering at the Institute of Neuroinformatics since 1998. He leads the Sensors group which focuses on neuromorphic sensors and processing. He received his Ph.D. in the Computation and Neural Systems program at Caltech. He worked on electronic imaging at Arithmos, Synaptics, National Semiconductor, and Foveon. He co-organized the Telluride Neuromorphic Cognition Engineering summer workshop and the live demonstration sessions at ISCAS and NIPS, and is former chair of the IEEE CAS Sensory Systems Technical Committee. He has been awarded 9 IEEE awards and is an IEEE Fellow. Giacomo Indiveri is a Professor at the University of Zurich’s Faculty of Science. He obtained his M.Sc. degree in Electrical Engineering and his Ph.D. degree in Computer Science from the University of Genoa, Italy. He is an ERC fellow and an IEEE Senior member. His research interests lie in the study of real and artificial neural processing systems, and in the hardware implementation of neuromorphic cognitive systems, using full custom analog and digital VLSI technology. Adrian M. Whatley gained a degree in Chemistry at the University of Bristol in England in 1986. After working for 10 years in the British computer industry, he took up his current software engineering position at the Institute of Neuroinformatics where he works primarily on asynchronous Address-Event communication systems. Rodney Douglas is a co-founder of the Institute of Neuroinformatics. His central research interest over the past 25 years has been the nature of computation by the circuits of the neocortex and their implementation both in software simulation, in custom electronic hardware. The experimental aspect of his work has inspired a number of cortical models of processing that use recurrently connected neuronal architectures. He is currently exploring principles of self-assembly in simple organisms and circuits which he considers crucial for building truly autonomous neuromorphic cognitive systems.